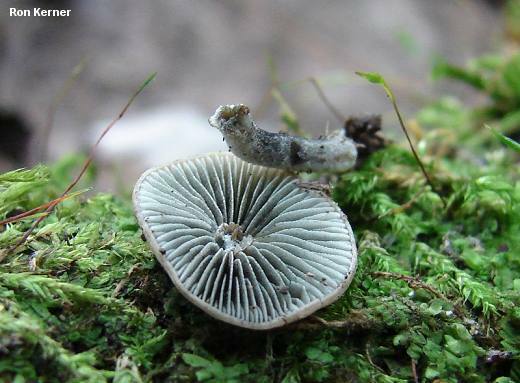 This tiny but fascinating mushroom has been collected several times by amateur mycologist Ron Kerner, in Indiana, on a moss-covered hardwood log. It has greenish-bluish young gills, an oddly rugged cap surface, a black to purplish black spore print, and gorgeous microscopic features. Its gills become mottled as the spores mature, suggesting Panaeolus--and microscopic details confirm the idea. A few species of Panaeolus are described from woody substrates or moss, but they are apparently rarely collected. Among these, Alexander Smith's Panaeolus fontinalis is a fairly good match for Ron's mushrooms--though this species name has been reduced to synonymy with Panaeolus reticulatus by some European researchers (see the discussion below if you care). 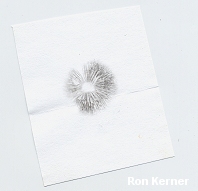 Thanks to Ron Kerner for collecting, documenting, and preserving this mushroom for study; his collection is deposited in The Herbarium of Michael Kuo. Ecology: Apparently saprobic; growing alone to gregariously on a moss-covered, decorticated hardwood log in October; Monroe County, Indiana. Cap: 1-3.5 cm; convex, becoming nearly flat; slimy when fresh; minutely pitted and wrinkled, but bald; medium brown with olive shades, becoming paler olive brown; the margin not lined, lacking partial veil fragments. Gills: Attached to the stem, or pulling away from it with maturity; close; bluish-greenish when young, but soon developing gray to black areas and acquiring a mottled appearance; eventually grayish to blackish overall; edges whitish, finely serrated. Stem: 2.5-4 cm long; 6-8 mm thick; more or less equal; finely hairy to powdery; whitish; basal mycelium white. Odor and Taste: Odor not distinctive; taste not determined. Spore Print: Purplish black to black. 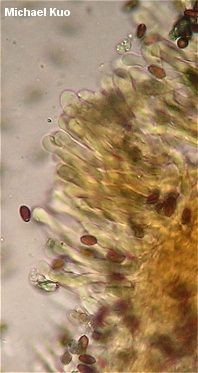 Microscopic Features: Spores 7-8 (-9) x (3-) 4-5 (-6) µ; smooth; slightly truncated; with a pore; dark brown in KOH; brown in Melzer's reagent. 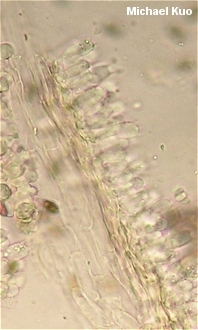 Basidia 4-sterigmate; clavate; to about 30 x 6 µ. Lamellar trama parallel. Pleurocystidia not found. Cheilocystidia numerous and prominent; 60-75 x 5-7 µ; cylindric to subclavate or subcapitate; ochraceous in KOH. Pileipellis hymeniform/cellular, with individual terminal components subglobose to irregular, 12-20 µ across; with frequent pileocystidia 50-75 µ, hyaline to ochraceous, cylindric to subclavate or subcapitate. 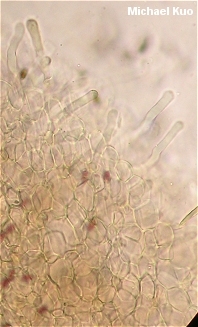 Caulocystidia in bundles; 50-60 x 5-7 µ; cylindric to subclavate or subcapitate; hyaline to ochraceous. Clamp connections present. As a morphological species Ron's collection comes very close to Panaeolus fontinalis, originally described by Alexander Smith (1948) on the basis of collections made over a two-day period in northern Michigan. 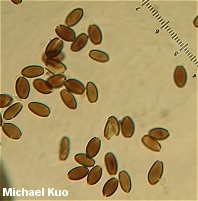 The microscopic features of Ron's collection are virtually identical to those described by Smith, although the cystidia are somewhat longer--and the only significant macroscopic differences are the more conic and smoother cap described by Smith, along with the thinner stem (1-2 mm wide). However, Smith found Panaeolus fontinalis "[s]cattered on black muck among liverworts and a species of Mnium [mosses] in a springy area in a cedar swamp," rather than on wood. 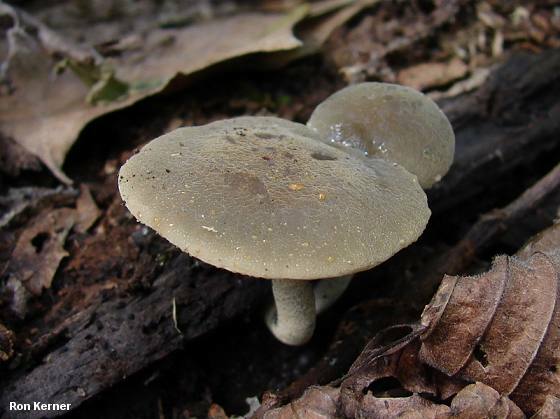 Another Smith species, Panaeolus fraxinophilus, was originally described (1948) as growing on the "naked trunk of a fallen ash tree" in New York and later described by Smith, Smith & Weber (1979) as "[g]rowing on wood of hardwoods (especially ash)" in the "[e]astern United States, apparently rare." The latter description may represent an unscientific assessment of possibilities, based only on the type collection, since there are no further collections of Panaeolus fraxinophilus (made by the Smiths, Weber, or anyone else) listed in the country's major herbaria. (The type collection is now housed in the University of Michigan Herbarium.) 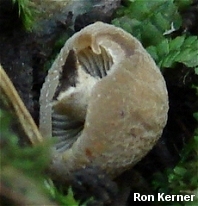 While the wood habitat of Panaeolus fraxinophilus matches Ron's collection, however, the morphology is not as good a match as Panaeolus fontinalis (the spores are too large, and olive shades are not mentioned, among other things). 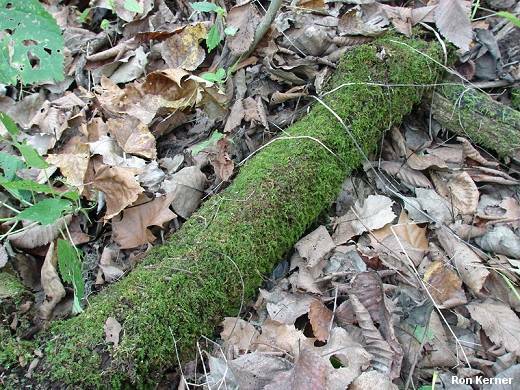 Since Ron's collection was made on a mossy log, it seems reasonable to assign it to the moss-loving Panaeolus fontinalis, which matches in morphology, rather than the wood-loving Panaeolus fraxinophilus, which does not--and Ron's collection keys to Panaeolus fontinalis in Ola'h (1969) as well as in Smith, Smith & Weber (1979), if "[h]abitat on moss beds" is chosen over "on wood of hardwoods." But European mycologists since Ola'h (Breitenbach & Kränzlin, 1995; Gerhardt, 1996) have dumped Smith's Panaeolus fontinalis in the taxonomic trash bin, reducing it to synonymy with the European Panaeolus reticulatus--which is originally (and ironically) a North American taxon described by L. O. Overholts (1916) from a collection made "on earth in flower beds in the Missouri Botanical Garden" (where, incidentally, I saw but did not collect some Panaeolus-like LBMs in flower beds when I lectured there last month . . . oops). Overholts's species (let's forget about the Europeans for the moment) matches Ron's collection better than Panaeolus fontinalis, in some ways; Overholts calls for a cap that is "hemispheric then expanded," and "everywhere pitted or when older appearing fibrous-reticulate," and cites the width of the stem as "4-8 mm. thick." However, Overholts does not mention olive or greenish shades, and the spores are a little long for Ron's collection. Smith was well aware of Overholts's species when he named Panaeolus fontinalis; a type study of the Overholts collection is included in the same publication that authors the new species. Smith amends Overholts's original spore dimensions ("8-10 X 5.5-6.5 µ") upwards, to "9-11 (12.5) X 5.6-6.2 X 6.5-8 µ"--substantially larger than the "7-9 X 4-5 X 5-6.5 µ" of Panaeolus fontinalis. The combination of "[t]he habitat, very small spores, and olive buff gills characterize the species," according to Smith. The Europeans do have a moss-loving Panaeolus that is very close to Ron's collection, to Panaeolus reticulatus, and to Panaeolus fontinalis. For example, take a look at this collection, posted to an amateur mycological forum in Italy--and be sure to scroll down and continue clicking in order to view the many photos of macro- and microscopic details. Gerhardt (1996) reduces Panaeolus fontinalis to synonymy with Panaeolus reticulatus without providing an argument. Online records at the University of Michigan Herbarium show Gerhardt placing the type collection of Panaeolus fontinalis in synonymy with Panaeolus uliginosus in 1982; his 1996 publication subordinates both of these names to Panaeolus reticulatus, but only discusses the synonymy of Panaeolus uliginosus. Breitenbach & Kränzlin (1995) also synonymize these species without explanation. But Panaeolus fontinalis can only be synonymized with Panaeolus reticulatus if fairly substantial differences in spore dimensions and colors are ignored--and Gerhardt is therefore inconsistent, since he separates other Panaeolus species in his monograph on precisely these characters. 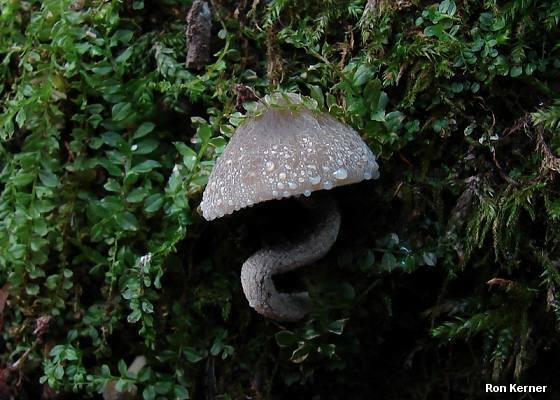 Perhaps the Europeans are right, and their moss-loving species is indeed the same as Overholts's Panaeolus reticulatus and Smith's Panaeolus fontinalis, in which case Overholts's name is the oldest, and would be correctly applied. 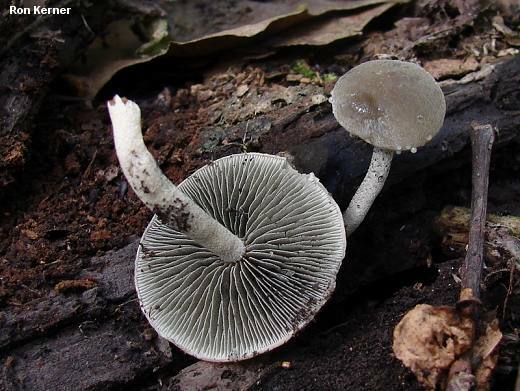 However, the resulting "Panaeolus reticulatus" would be rather variable in both macro- and microscopic features--more variable, in fact, than the European descriptions acknowledge, since they are based on the European mushrooms and erase much of the variation expressed in the descriptions of Smith and Overholts. REFERENCES: Overholts, 1916; Smith, 1948; Ola'h, 1969; Stamets, 1978; Smith, Smith & Weber, 1979; Breitenbach & Kränzlin, 1995; Gerhardt, 1996. Herb. Kuo 10060701.